In case you haven’t heard, the second annual Global Supply Chain Resiliency Council and Awards Event is just around the corner, set to take place on February 24th, 2016 at The Sheraton Palo Alto. 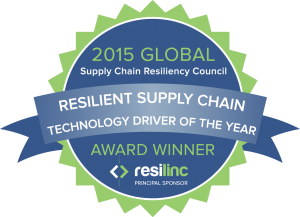 The GSCRC awards program recognizes organizations and individuals that are role models and leaders in driving supply chain resiliency strategy innovation and best practices within their company, supply chain community, and across industries. The awards committee considers nominations received from its Council members. If you’re not already a Council member of the GSCRC, don’t hesitate to hop on board – it’s as simple as joining the LinkedIn discussion group! 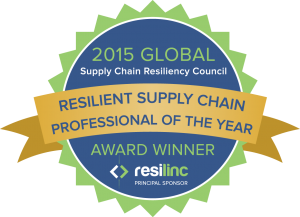 With the second annual Global Supply Chain Resiliency Council and Awards Event approaching, we’d like to take a moment to recognize this year’s award recipients, as well as remind you to submit your nominations for the upcoming awards event by January 15th, 2016. People: The company fosters a culture of risk management and resiliency excellence via executive leadership sponsorship and professional development and advancement opportunities (e.g. career growth paths and training). Processes: The company’s SCRM and resiliency processes are at an advanced level of maturity and there is a commitment to institutionalizing best practices, and demonstrating innovation and continuous improvement over time. The individual is successful in championing the importance of SCRM within his/her company and acting as a successful change agent. Individual is active across the industry in advancing the profession by sharing best practices, successes and lessons learned via active participation in industry events and media communication opportunities. Supply intelligence is shared with customers proactively or in a highly responsive manner if requested. The company strives to understand customer requirements and for transparency and is willing to share appropriate information for mutual benefit. The company is instrumental in developing and improving communication and survey response processes (e.g. potential disruption risks, ER plans, BCP and CSR policies, etc.) and potentially change notifications. The company uses advanced technology (e.g. cloud, analytics, visualization, mobile, social media technologies) in support of resiliency strategies and goals such as improved customer collaboration. The technology has been accepted and adopted by key SCRM professionals as evidenced by high connectivity/usage rates (e.g. percentage of users that are trained to use the system, percentage of users that login every day). The company fosters an organizational culture that rewards technology adoption and risk taking, and a commitment to leveraging technology innovation to drive continuous improvement over time. The company has achieved a quantifiable ROI or a measurable benefit by using technology to address a significant supply chain risk management challenge. The individual plays a pivotal role in talent development for the supply chain industry with a special competency in risk management. This award also recognizes educators that play an important role in cross-pollinating ideas and strategies between academia and the business community. Nominating a company or individual for one of the five GSCRC awards is easy and only takes a few minutes. In addition to nominating other companies and individuals, participants are free to nominate themselves and/or their respective organizations. The award winners will be recognized at the GSCRC & Awards event on February 24th in Palo Alto, California. All current and future GSCRC members are heartily encouraged to attend the Global Supply Chain Resiliency Council & Awards event – it is the premier event in this field and a key channel for member networking and knowledge sharing. As a GSCRC member in attendance, you’ll join the ranks of the leading professional community and network for supply chain risk management practitioners, leaders, and stakeholders.